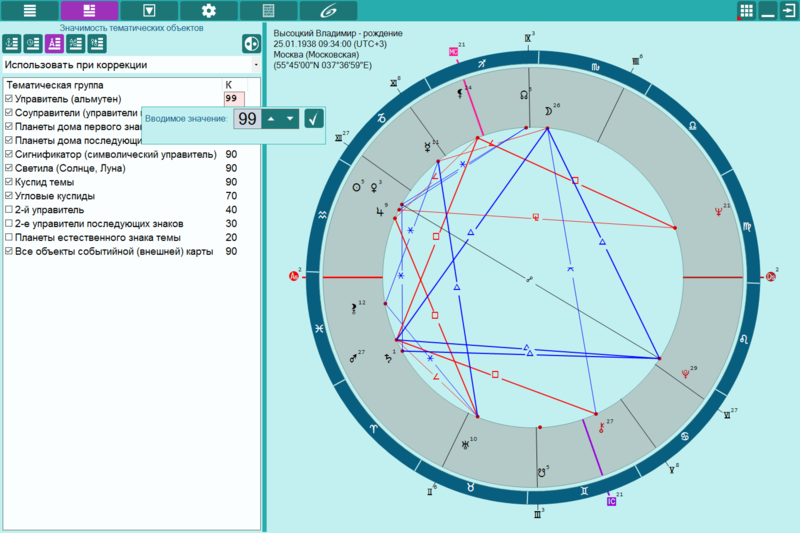 Prognosis (GalaxyPrognosis) is a software application that enables to create forecast on given themes of the astrological houses, taking into account the exact birth time, the significance (strength) of natal chart objects and the current celestial environment. 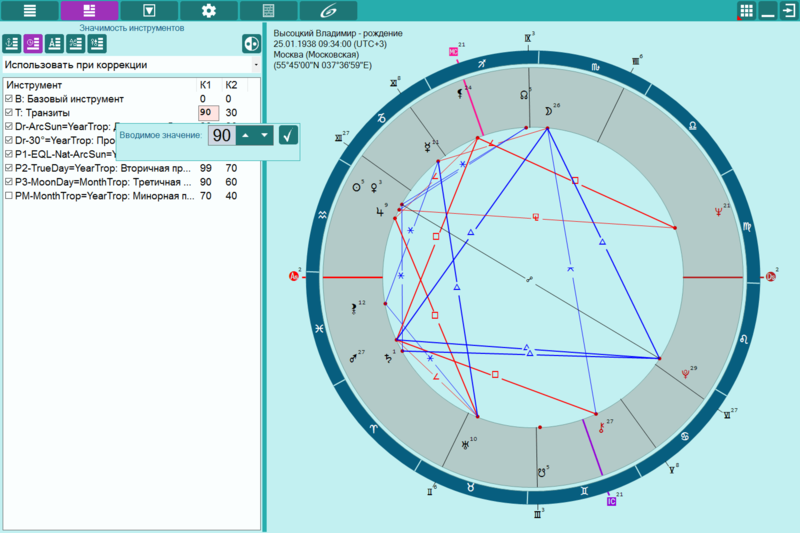 Astrological forecast is based on the use of strength (significance) of the planets, weight (significance) of astrological instruments (transits, directions, and progression), strength (significance) of aspects, strength (significance) of thematic groups of objects and automatic determination of the thematic chart objects. Data entry page: standard page for all programs working with charts. The event is selected to perform marriage prediction (7th house). 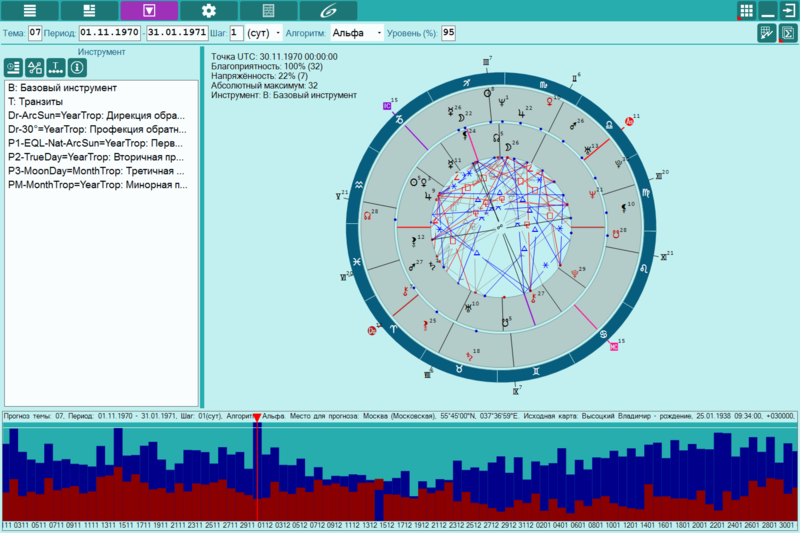 The astrologer's work on prediction of an event is similar to a prospector job: an astrologer is seeking significant confirmation of event occurrence on a given theme gradually sifting time. 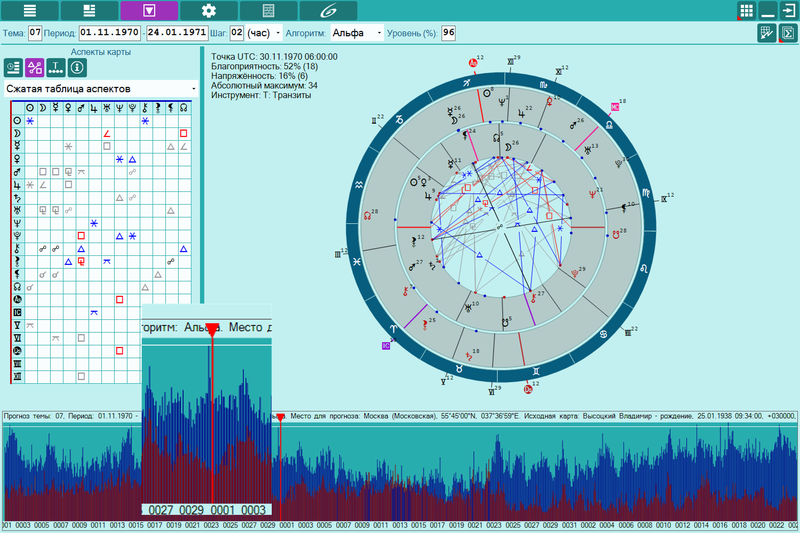 Gradually narrowing the given time range and using faster astrological instruments, he finds significant aspects in the predictive charts, indicating a fairly high probability of future events. Primary consideration of sufficient long time period with a large increment of change (> day). Found aspects are very significant and unique throughout the querent's life. At this stage the shorter time periods found previously are considered with time increment from a few hours to a day. Found aspects are unique, at least within a year of querent's life. We consider the shorter periods found at the 2nd stage with time increment from a few minutes to an hour. Found aspects are unique, at least during the day of the querent's life. Considering any period and finding value, an astrologer can not say if this is a lot or a little. He can only compare those values which he sees. When performing election or prediction the working period is always set where their local minimum and maximum will be found. To use effectively workplace of a monitor all values are reduced to a single scale. At the same time an astrologer sees highs and lows in the reporting period and draws conclusions on their basis. Use fast astrological instruments with a small step for the periods found on the 1st stage to achieve a goal. This phase of detailed analysis.